I recycled this tub from the garage. 🙂 DH wasn’t really using it. 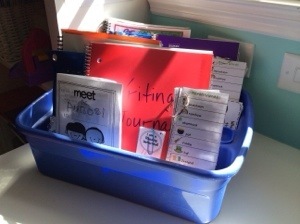 Each side has notebooks and writing tools for each of my 2nd grade students. 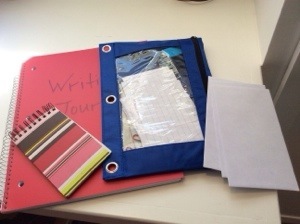 Some of the items I’ve included in the tub: notebook with blank lined paper, small notepad for list-making, envelopes to actually mail hand-written letters, erasers, scrap papers for rough drafts, notes, etc. Who doesn’t love hand-me-downs? Even better, hand-me-down books! In this case, our old neighbor (well, she isn’t old, but old as in she used to be our neighbor before we moved) gave me an earlier edition of Webster’s Elementary Dictionary that her children had outgrown, but it is in excellent condition and looks like a piece of art on our writing center desk! I HIGHLY recommend it for elementary students, and amazon lists it for grades 3-5. 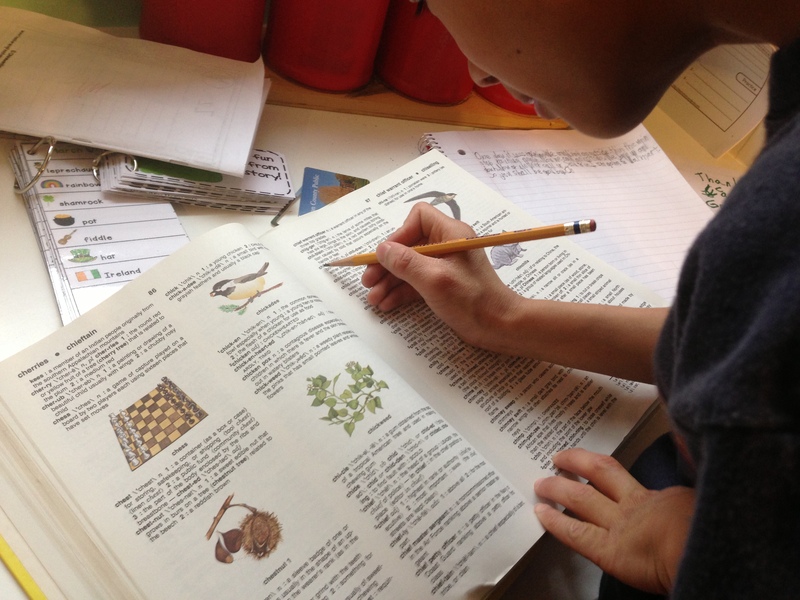 Speaking of dictionaries, we are still making good use of our personal dictionaries I found over at Teachers Pay Teacher’s in OkinawanGirl’s Store. She has several versions, and we bought this one! After I had our first son, I quit the job to become a full-time SAHM. But a few months later, the large publisher asked me if I’d be interested in contract editing. That *short* stint ended up lasting 10 years, and I LOVED every minute *truly* of editing. Now, I am trying to make little editors out of these sweet peeps. They are taking well to it as of late. I LOVE the punctuation posters I found on TpT (of course!). And the best part: they are FREE. If you’d like your own set, just visit Erin’s store and grab your own. Don’t forget to let Erin know how great they are while you’re there! If this wasn’t enough, Erin also has a FREEBIE reader that reinforces the Puncs, and prints fantastic in grayscale! I let my students color their own copies. 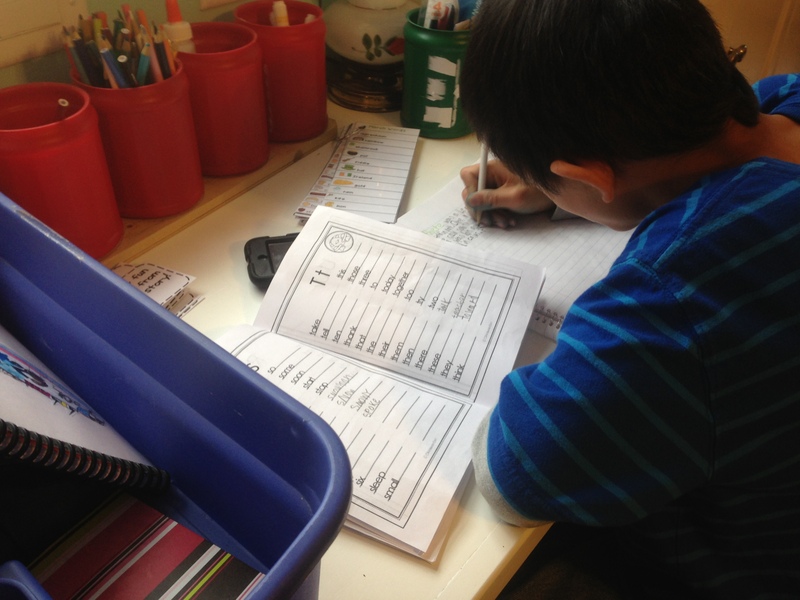 This little man is LOVING writing more and more. I never thought this would be. He is even accepting of the fact that every good writer acknowledges a need to edit and actually edits his written work. 😉 I need to add a sample of his writing. He is REALLY liking another resource I scored at TpT. 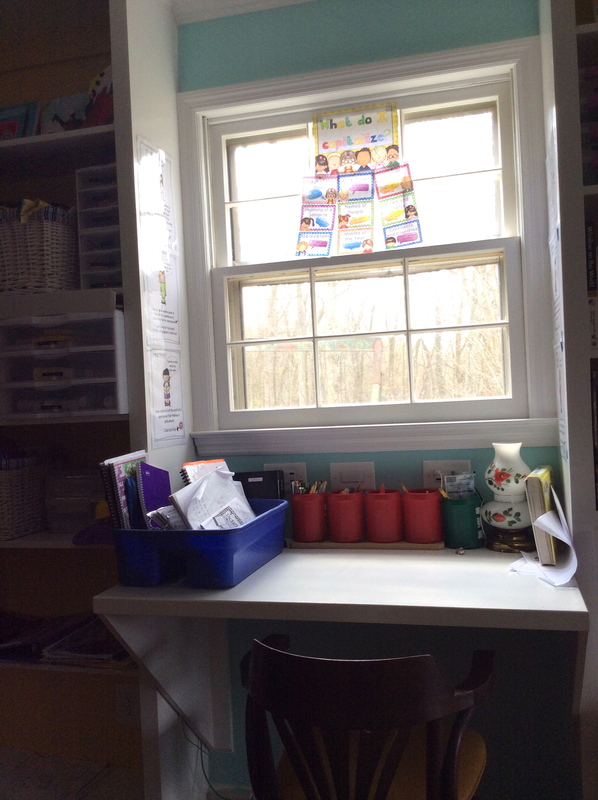 I bought two things during the February TpT 3 Million Strong Sale, and these resources have elevated their interest in writing and helped them succeed! You might want your own sets! 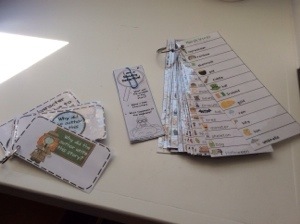 On the left is Miss Martin’s Be a Reading Detective Task Cards and Bookmarks. LOVE!!! and so do my 2nd graders. The task cards are enough, but then Miss Martin included these fantastic bookmarks that students can use while reading. They are guaranteed to get your students thinking! 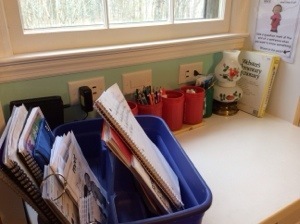 On the right is Renee Dooly’s Writing Center Tools with SO MANY words that you won’t have to spell a THOUSAND times a year. 😀 Happy Teacher equals Happy Students. Enough said. You need these if you have a writing center. I think my favorite part about this Writing Center is we can grab and go with the meat of it. 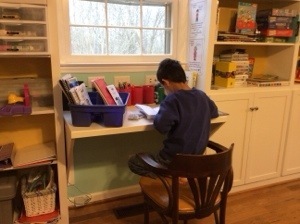 I am really trying to amp up our writing work, and so far this little piece of our schoolroom dedicated to creative writing is doing the job. I have been adding to our little writing desk over the last couple of weeks. 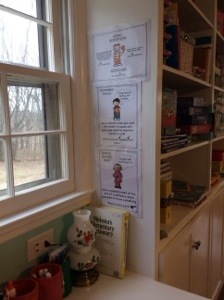 The latest editions are some more goodness from Teachers Pay Teachers: “What Do I Capitalize?” posters (that I printed 3 to a page for some space-saving and they are still very readable–picture just isn’t so great, but the posters are!) AND Writer’s Workshop Editing Helps. We have already put the Capitalization posters to work! I am going to laminate the editor’s checklists after printing some on appropriately colored paper (for each student). If you’d like to get your own set, just click on the the links above to go to these gems! Today’s Tip: ALWAYS find positive things to compliment your students’ writing before offering any constructive criticisms or edits. 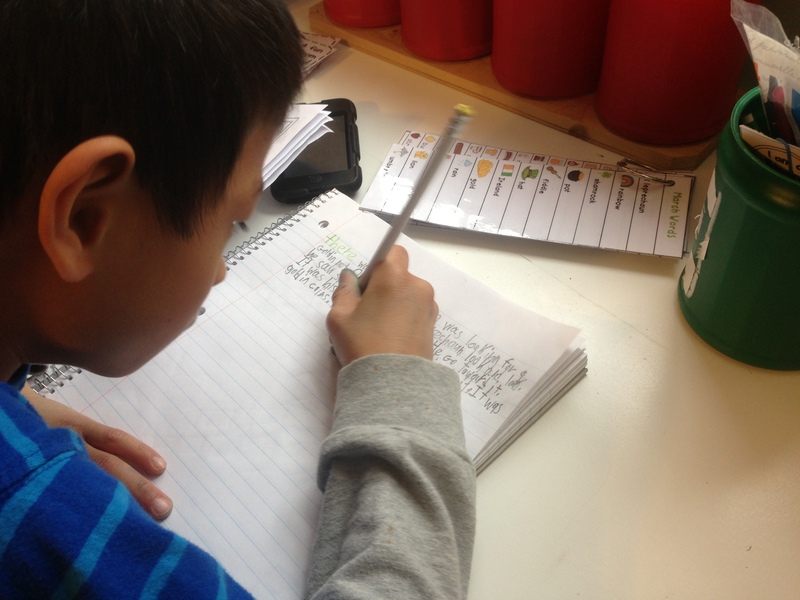 Today’s Questions: How do you foster a love of writing in your students? How do you incorporate it into other necessary skills you are teaching?